Learn WordPress website pricing strategies to use when you don't have a clear scope of work, including technical assessments, scoping projects, discovery projects, and more. In a perfect world, every potential client who contacts you about a new project would know exactly what they need, have a clear scope of work with a requirements list, and understand the costs associated with their request. But when you’re a web designer or web developer, perfectly educated clients are rarely reality because they don’t build websites or work with WordPress for a living, they don’t spend all of their time learning about web design and web development, and they aren’t WordPress experts. Often the process of providing a web design quote is a process of discovery, like peeling back layers of an onion to learn about obstacles and constraints, gain clarity about requirements and objectives, set expectations, and map out the final scope of work and project deliverables. Without enough information upfront, providing a WordPress website quote is tough because assumptions and educated guesses must be made about the full scope of work and that is never the best approach. If the quote is too high, there is a risk of losing the project and the client. If the quote is too low, there is a risk of not being taken seriously or being second-guessed as to why your estimate doesn’t align with other quotes gathered. When information is missing, it causes problems for potential clients as well, creating a confusing gap between the expectations of the prospect and the estimate provided by the designer. This gap can be difficult to overcome, especially if the designer or developer isn’t confident in communicating the value they deliver and skilled in explaining the reasoning behind and benefits of the solution they are proposing. When due diligence is done and a potential client works with you during the estimating process to provide as much detail and information as possible, the result is a clear, accurate, detailed estimate and everyone wins. Web designers and web developers win because they are able to confidently deliver an accurate estimate based on clear deliverables, timelines, and an agreed upon scope of work — and they will enjoy fees that are in alignment with their experience and expertise. Clients win because they receive a clear, accurate website estimate that explains exactly what they will get, at what price, and when. This helps set expectations, dispel confusion, and reduce revisions and future surprises. When you quote new WordPress projects accurately and have open, honest conversations with new clients about price and expectations, website projects run more smoothly, there is less stress, you will enjoy your work much more, and overall profitability will increase. In all of these scenarios, it’s easy to fall into common pricing traps and make mistakes that can create stress, frustration, and potential conflict. As a professional web designer or developer, you can’t take a client’s word on face value alone because often there is much more to the story that isn’t being shared. By not getting all of the information needed up front, projects are more likely to hit major obstacles and delays, require change orders, and encounter added cost. When asked for a website quote by a potential client, it’s easy to fall into the trap of basing the cost on the amount of time it takes to do the work. The problem with that approach, however, is that it fails to account for the hours spent on project management, email communication, meetings, phone calls, research, training, file preparation for print or go-live, revisions, searching for stock photos, testing typography stacks, brainstorming or sketching ideas, and configuring premium plugins, etc. I know you want your clients to love you and you want to make it easy for them to say yes and hire you. But this desire to make the sales process as short and easy for the prospect often leads to website estimates based on what something similar “should cost” instead of what it actually costs. These estimates are often MUCH lower than they should be because they are based in fear not real data. 2018 marks 21 years of working as a web designer and 13 years as an agency owner. In that time, I have made all three of the pricing mistakes listed above and more, and I have learned quite a few lessons about WordPress website pricing along the way. Those experiences are what allow Bourn Creative to now confidently provide accurate website proposals for new work that are a great fit for our collective expertise. Let’s look at the four most common website pricing scenarios we encounter with potential clients, where there are unknowns and uncertainty, and explore the best ways to handle them and price the websites accurately. Rarely is simple ever simple. What seems simple to a potential client — like a basic five-page website — is actually quite complicated and often several external factors must be accounted for due to their impact on the project. Technical Debt: Technical problems or issues that existed before you got involved. This may include things like hosting accounts with other websites in it, messy hosting accounts, lost passwords, no access to accounts, past hacked sites, outdated WordPress installs or plugins, etc. Lack Of Branding: A simple website design project quickly becomes something much more complex if the client doesn’t have a logo, color palette, or typography stack established and the designer or developer must create it as part of the project. OPTION 1: Most technical debt issues happen when taking a new website live. If dealing with an existing hosting account, consider quoting a flat rate for the theme design and development, and quote the go-live of the final site hourly (with a ballpark range/not to exceed amount) to ensure your time is covered. OPTION 2: Offer a paid technical assessment to be completed before you quote the project. In the paid technical assessment, review the existing site, hosting account, forms, and more to identify any potential issues. At the end of the technical assessment, the client has a report of the findings, and you have the data needed to provide an accurate estimate based. If the client signs the contract, consider offering to apply the technical assessment fee toward the initial deposit. Be very clear about what IS and IS NOT included in the base estimate. Include items like brand design or email newsletter template design and setup as optional “add-ons” in the proposal. This will establish that they are not included and set an expectation of cost should they be requested later on. Sometimes you’ll receive an inquiry from a potential client who originally hired another company and are now looking for a new partner. In this situation, before getting to an official proposal, pitch a discovery project with a set number of hours. Discovery Projects allow you to see what was really going on in the back-end of the website and gives the potential client the ability to test the waters and see what it would be like to work with you. At the end of the discovery project, the potential client has a report of exactly what was done, what is still left to do, what concerns/issues were identified, and how we propose to handle the new issues moving forward. Agree on a set number of hours for a flat fee. Outline the deliverables or tasks to be completed and prioritize the list. Over-communicate and communicate clearly — let them know exactly what’s happening, what you are finding, and how it will impact the list of desired deliverables. Create a plan for what happens after the discovery project is over (this will shape your future estimate). Establish boundaries and expectations, demonstrate processes, and set the tone for the rest of your relationship. It is very difficult to provide an accurate website estimate when the prospective client provides no details about what they want or need. In this situation, send the prospect an email with follow up questions. If they respond and provide good answers, schedule a call to dig in deeper and get the information you need to provide an accurate estimate. If the website project is more complex — like a membership site, online course, or eCommerce site — and the prospect hasn’t yet thought through the details, consider pitching a Scoping Project. In a scoping project, the prospective client pays you to help create the project requirements document or creative brief. You and your client decide that you enjoy working together and armed with a clear scope of work, you can now provide a detailed, accurate estimate for the design and development of the project. You decide during the Scoping Project that the partnership isn’t going to be a great fit. In this case, the client now has a clear scope of work and requirements document they can take to any other company to get a quote. Some prospects don’t want to provide any information about their project. Most of the time these inquiries are ignored or deleted because the prospective client isn’t serious about their project or they are spamming inquiry forms hoping for a cheap quote. If you interact with a prospect who demands an estimate without providing any information, you need to make an educated guess as to what the project scope will be based on your previous experiences. You also need to add extra “what if” pricing to cover your time if the worst case scenario presents itself. Quote the potential client your hourly rate, give them a ballpark range of hours, track your hours, and bill them for the total. Remember to track your time for discovery, research, client communication, project management, phone calls, meetings, file preparation, design, and development, etc. Use a three-pronged approach, evaluating 1) the estimated number of hours you think the website design and development, 2) the best case scenario number of hours, and 3) the worst case scenario number of hours. Use these three numbers to make an educated decision about the final estimate amount. When communicating with prospects, don’t rely solely on email. Pick up the phone, schedule a Zoom meeting, jump on Skype, or do a Google Hangout as soon as possible. You will gain much more insights into your client’s feelings and attitude about the project when you can hear their voice, or even better, see their body language and facial expressions. Ask a lot of questions and to keep asking them until you get the clarity you need to provide an estimate you can feel confident about. When you say X, what does that mean to you? Can you explain your thoughts behind X? Occasionally a potential client will get testy about the persistent question asking. It’s important to communicate that when it comes to technology, often times people mean very different things when using the same language. Share that your questions are critical to ensure everyone is on the same page and that no incorrect assumptions are being made. The goal here is to provide the client the most accurate and complete website estimate possible and reduce or eliminate future surprises. If a potential client will not answer your questions, will not speak with you on the phone about the project, and is extremely difficult to communicate with, consider turning the client down. Likewise, if the project isn’t a great fit, refer it to another designer or developer who is a better fit. At Bourn Creative, for us to consider a project, it must be a match for our skillset, interesting and fun to work on, and return profit to the company. If we are presented with an awesome new project and there is one aspect of the project that will be new for our team, we will provide a proposal for the project and reinvest the agency profit back into the project to learn something new and boost our skills. If the potential project has two elements that are new for our team and we already have an existing relationship with a specialist in that area, we will take on the project, again dedicating our profit to learning something new and boosting our skills. If there are three or more elements of the project that are unfamiliar to us, we will pass on the project and refer the client to someone else we know and respect. We never increase the price of a project to cover our learning time. Pricing WordPress websites with unknown variables isn’t easy for anyone. Inaccurate website estimates based on assumptions and guesses, result in more obstacles and delays, increases in cost, and decreases in profitability. 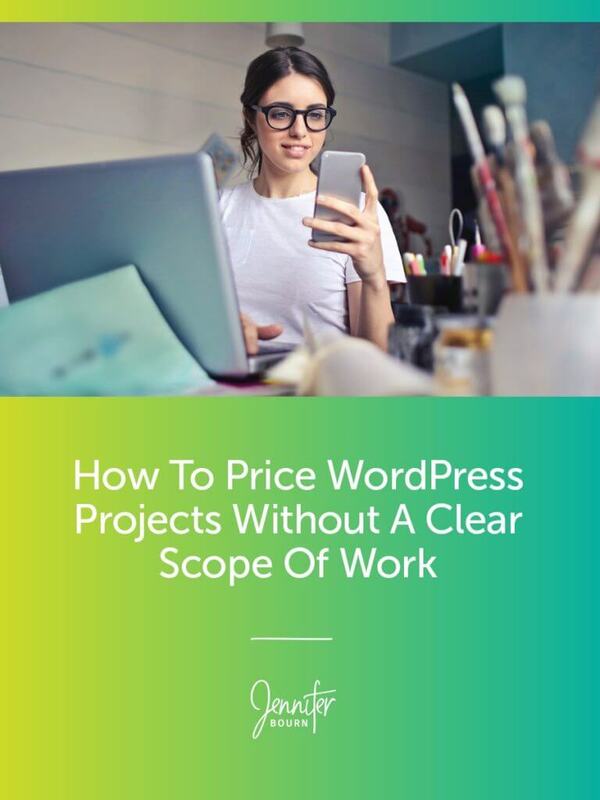 On the other hand, understanding how to price WordPress projects will create more successful client relationships, fewer surprises, and greater satisfaction. By taking the time to do the necessary due diligence up front, asking a lot of questions, and pitching a technical assessment, scoping project, or discovery project, you can mitigate the challenges that come with unknowns and gain the knowledge you need to provide a clear, accurate website estimate.